Charming single family homes, Flamingo area. Land size 0.16 acre. Construction area 1,411 sq ft, 2 bedroom(s), 2 bathroom(s), air conditioning, parking and swimming pool. Flamingo area, Charming single family homes, for sale, 298 900 US $. Scenery : Mountain views. Lovely new home for sale in privileged surroundings, very close to the gorgeous beaches of the Gold Coast! Within a sought-after 750-acre ocean view community, great opportunity to buy a new home. This one will feature 2 bedrooms, 2 bathrooms, a living room, an open-plan kitchen, a laundry room, and a terrace, and will be complemented with a mountain view garden and a swimming pool! Several options are still available concerning the choice of lots, among which ocean view lots. A large choice of model homes is also proposed in order to fit all budgets and architectural desires. The first packages, including the house, the pool, a paved access road, and a mountain view lot, are offered at the attractive price of $298,900! For those who prefer to buy an existing home, several houses are already built and just wait for their happy owners. A financing by the developer is also available. It is good to know that this type of house is also a good investment for medium and long-term rentals. Enjoying a 24/7 security, this residential community boasts splendid views over Conchal and Brasilito bays and is located just a few minutes' drive from fantastic beaches! The project has been implemented by one of the leaders of development in Guanacaste. The high quality infrastructure includes paved roads with a gutter system, underground utilities and, last but not least, its own water, i.e. enough water to cover 2 ½ times the entire project. Moreover, owners benefit from numerous amenities like a clubhouse, a restaurant, a swim up bar and an infinity-edge pool that offers sunset views all year long, red clay tennis courts, a large park with a stone amphitheater, a tilapia pond, a natural grotto-style swimming pond, a natural waterfall and an organic orchard. Finally, this residential gated community is only a short fifty-five-minute drive to the rapidly developing Liberia International Airport. A home to build with high quality finishes, privileged surroundings boasting spectacular ocean views, an optimal security, as well as a perfect location close to wonderful beaches, and all this under the sun of Costa Rica... A piece of paradise to discover! Contact us by email and we will be pleased to give you further information. 595 000 US $ Tamarindo area Nice rental incomes! 579 000 US $ Playa Grande area Green home perfectly in the spirit of the times! In the community of Hacienda Pinilla in Costa Rica, beautiful brand new home for sale only a short distance to the ocean! 659 000 US $ Hacienda Pinilla area Very good value for money! In Playa Negra, property for sale with 3 houses within a large 2.46-acre garden! 549 000 US $ Playa Negra area Ideal property for nature lovers! A short distance from Tamarindo, property for sale consisting of 2 houses with swimming pools and beautiful panoramic views on the hills! 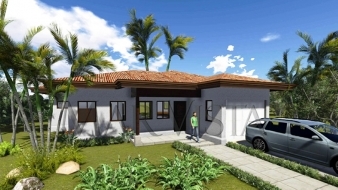 650 000 US $ Tamarindo area Bright and newly built houses!